Half French, half American, Karim Geist grew up between Paris and NYC. He wrote a book called Le New York des New Yorkais, (mostly about eating and drinking your way through the city), then worked as a journalist and an English teacher before suggesting to a friend and fellow wine lover Dave Brodeur, that they open a bar together. Dave, who already had a bar in Costa Rica and had worked in one in NYC wanted to open their joint bar in NYC. However Karim convinced him to move to Paris and it’s here, on 19th September 2017, that the adventure started, with the opening of Le Comptoir du Canal. They chose the location in the Bassin de la Villette because there was nothing like it in that area and the neighborhood really responded positively. 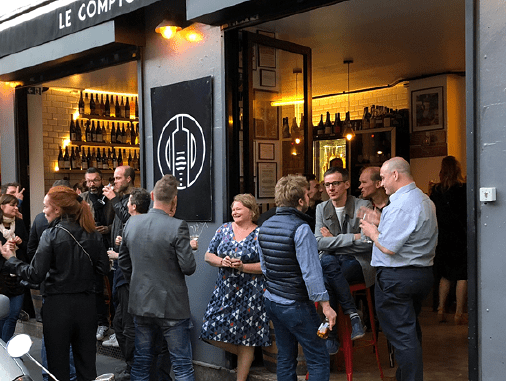 It’s a real neighbourhood bar where the most important thing is “la convivialité.” Every night, they enjoy watching strangers start up conversations with each other and even share their wine and food. The natural wine selection they offer is constantly changing, because they work with small producers and there isn’t always enough available to guarantee a permanent stock, but this also means there is always something new to try. The meat and cheese plates that accompany the wines also change about once a month for the same reason. Notable mentions: La Cave de Septime and Naturellement.